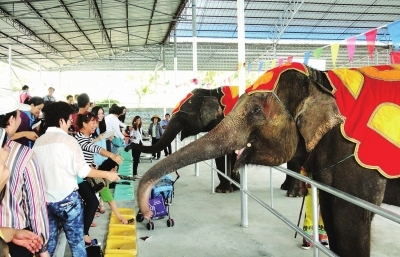 The Thailand Elephant Performance Center in Sanya officially opened to the public on Jan.31 after one-month’s trial operation. Located opposite the marine zoological park in Tianyahaijiao Scenic Area, the center has a total land area of 28 mu, and can handle 1,000 visitors at a time. The center gathers a well-trained international performing animal team which includes many exotic animals such as Thai elephants, African lions, Tibetan wolves, bears, goats, macaque monkeys and tigers to entertain the public with their breathtaking performances. Besides, the audience can also enjoy many other humorous performances such as face-changing Sichuan Opera and acrobatics on a unicycle.